Passed away 11.04.2019 aged 94. Cherished Mum of Susan, Rinian and Gavin. A much loved Grandma, Great Grandma and Aunty. Please know you are all in my thoughts. I'm so sorry you are going through this and I hope loving memories bring you comfort. I was so sorry to hear of the passing of dear June. Such a wonderful person,and I had the pleasure of being with her during part of her long association with CWA. Her witty poems will long be remembered. The members of the old West Coast Plains Div. Chittering Bindoon Branch and she will be sadly missed by the members of the Bindoon Community. My thoughts will be with you all tomorrow. Grateful thanks for your help and encouragement with my meniere’s disease problems. 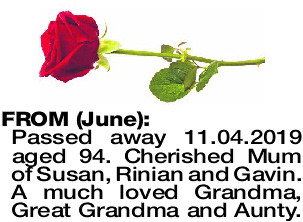 Our deepest condolences to Rin, Gavin and Sue for the loss of your Mum. What a wonderful lady she was. 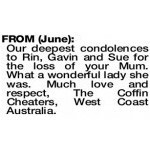 Much love and respect, The Coffin Cheaters, West Coast Australia. A treasured friend who will remain in our hearts forever. Thanks for being such a great mate. 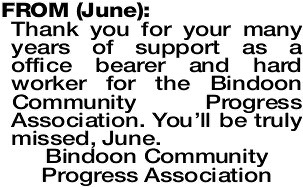 Thank you for your many years of support as a office bearer and hard worker for the Bindoon Community Progress Association. You'll be truly missed, June. 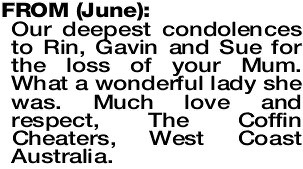 FROM JUNE Sincere condolences to Susan, Rin and Gavin and families. Walter and Ida Zemunik.